I’d like to share with you your very own inner weight loss secret. If you knew that you had within you one thing that could change your weight loss fate for good – and that scientific research could prove it – would you be interested? I’m here to tell you that your inner weight loss secret lies within your digestive tract and revealed within a program I’ve named Skinny Gut Diet. I call it the gut factor. Inside your digestive tract are trillions of bacteria that play a crucial role in not only your digestive and immune health but also your overall health – and most notably, your weight. Each of us has a unique balance of bacteria that either protects us and keeps us healthy or leaves us susceptible to disease. That same balance can either contribute to weight gain or to weight loss. When your gut bacteria are out of balance, you gain weight. Conversely, when you balance your gut by eating the right foods (and by avoiding the wrong foods) you lose weight, reduce cravings, ease digestive upsets, boost immunity, reduce inflammation and feel great. This is what the Skinny Gut Diet is all about! 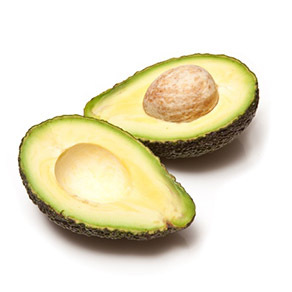 Healthy fats – especially those high in omega-3 – will help to quell the silent inflammation that comes with being overweight. On the Skinny Gut Diet, you will not have to track your fat intake. Instead, you will simply make sure that you are eating the right fats while avoiding the wrong ones. Living foods either contain beneficial bacteria or they act as food for the beneficial bacteria already in the gut. When you eat living goods on a regular basis, you will replenish the good bacteria in your gut, and you will increase your fiber intake, which helps control your appetite. In addition to fermented foods, you will also eat plenty of foods rich in soluble fibers called prebiotics that feed the good bacteria in your gut. Aim to include these high-prebiotic foods in your diet as often as possible. Eat protein at every meal and with every snack to eliminate cravings. 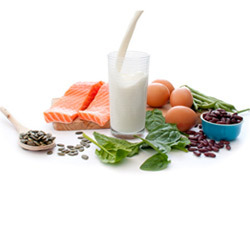 Protein is an important part of the Skinny Gut Diet. You will eat protein at each meal and snack to help keep your appetite satisfied. Eating protein throughout the day will help curb your cravings. Do you tend to crave carbs, snacks, or sweets mid-morning, mid-afternoon, or before bed? This is your body chasing the sugar high (and your unfriendly gut microbes chasing their next meal). Get Lean or Stay Lean Phase? If you are choosing the Skinny Gut Diet to help you balance your weight, then you will remain in the Get Lean Phase until you have reached your weight goal, at which point you will switch to the Stay Lean Phase, designed to help you fine tune your eating habits and personalize the diet according to your own body’s needs. If you are satisfied with your weight as it relates to your frame and you are choosing to make nutritional improvements to decrease silent inflammation, deal with chronic health issues, or to simply restore your sense of vitality and wellness, you may choose to begin with the less rigorous program offered in the Stay Lean Phase. I designed the Stay Lean Phase to be flexible because everyone is unique. During the Get Lean Phase you will set your target to between 8 and 10 teaspoons of sugar from all the foods you eat daily (including hidden sugar), using the Teaspoon Tracker calculation below. This will be your over-arching goal while you follow the 3 simple rules. Let’s use the Nutrition Facts panel that I’m sure you’ve seen on packaged foods. To determine the nutrient contents of fruits and vegetables you can find similar panels at nutritiondata.self.com, or by using an app like My Fitness Pal. Let’s look at Blackberries together. You can find the Nutrition Facts panel for Blackberries on this page. (15 grams Total Carbs minus 8 grams Dietary Fiber) divided by 5 = 1.4 teaspoons of sugar. That’s not a lot of sugar for a whole lot of delicious fruit! 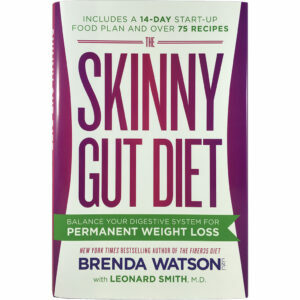 FYI, berries are listed as a “Fruit to Enjoy” in the Skinny Gut Diet on page 123. You will use the Teaspoon Tracker calculation to track your total sugar intake from all foods, not just sweet foods. Remember that this calculation tracks sugar that breaks down from carbohydrates too, so you will use it for all the foods that you eat. You will maintain your daily intake between 8 and 10 teaspoons of sugar until you reach your ideal weight when you will enter the Stay Lean Phase. Once you reach your desired weight, add two teaspoons of sugar to your daily total so that your target is 10-12 teaspoons of sugar daily from the foods you eat. Eat that way for a month. If you do not gain any weight or do not experience any digestive symptoms, or if you continue to lose weight, increase your intake of sugar from all the foods you eat by 2 more teaspoons. Continue using the Teaspoon Tracker calculation just as you have been, and eat that way for another month. Add two teaspoons of sugar to your total each month until you begin to gain weight or experience symptoms. At that point, you will know you need to decrease your daily teaspoons by two in order to maintain your optimal weight for life. Some people will be able to add more teaspoons of sugar to their total than others. People vary. You may be able to eat food that adds up to 14-16 teaspoons daily while your best friend may have to keep it to 10-12. The Stay Lean Phase is designed to help you find your perfect sugar intake so that your gut stays balanced and you maintain your ideal weight for your frame. In the Stay Lean Phase, you will continue to eat living foods every day, but you will be able to add certain foods like beans, grains, and additional fruits in small amounts. Because your total teaspoons of sugar (including hidden sugar) from all the foods you eat will increase by increments of 2 teaspoons at a time, you will be adding small amounts of these foods while remaining within your goal of daily teaspoons of sugar. Your digestive health is the foundation for your overall health. Because of this, achieving optimal digestion is the first step toward your ideal weight. There are four main supplements recommended being taken on the Skinny Gut Diet. I call it the H.O.P.E. Formula. H is for High Fiber: Achieving the recommended 20-35 grams of fiber each day is very hard to get through food alone, so a quality high fiber supplement in the morning and at night along with a glass of water can help you reach your daily fiber goals. Fiber can also be taken before meals to reduce hunger. P is for Probiotics: Take a high-potency, multi-strain probiotic daily. I recommend starting with at least 50 billion live cultures per serving that contains 10-12 different strains of bacteria. Remember, fermented foods offer lactobacteria. If you experience digestive symptoms, it may be helpful to supplement with a product that offers a higher ratio of bifidobacteria. Always read your label. E is for Enzymes: Take digestive enzymes with each meal to optimize nutrient availability, support healthy energy levels, and help prevent gas and bloating sometimes caused by dietary changes. Enjoy a high protein/fiber shake as a snack on a regular basis. If you are here on this website, you are likely facing the same struggle with weight and health that I have faced – endless dieting, endless cheating, and endless fluctuations of not only weight but the moods and other health conditions along with it. It’s a vicious cycle of battles and triumphs, up and downs, successes, and failures. I can tell you, it’s exhausting. I’ve been there. I have ridden the same diet roller coaster as you – until I decided to get off the ride. I went on a search for the real answer to weight loss and good health. What I learned I have shared in Skinny Gut Diet. Through my research and experiences working with others, I found that the only way to truly achieve lasting weight loss was by looking within and balancing the gut – that is, increasing the beneficial bacteria and decreasing the harmful bacteria. Without gut balance, you will only lose superficial weight and you will only achieve superficial health. By balancing your gut – and addressing your health at its true core – you will be able to finally get to the heart of what ails you physically, mentally, and emotionally. Truly, your health begins in your gut. Since the Skinny Gut Diet was published I have heard from so very many people who have effectively used this information on their path to wellness. There is even a private Skinny Gut Diet Facebook page that was started by a young woman who found the eating plan so helpful that she wanted to form a community of support! I look in on it regularly and really enjoy answering questions. Perhaps you’ll be interested in joining sometime soon.